Whenever I hit a tricky moment, or I want to learn and improve, my instinct is always to reach for a book. 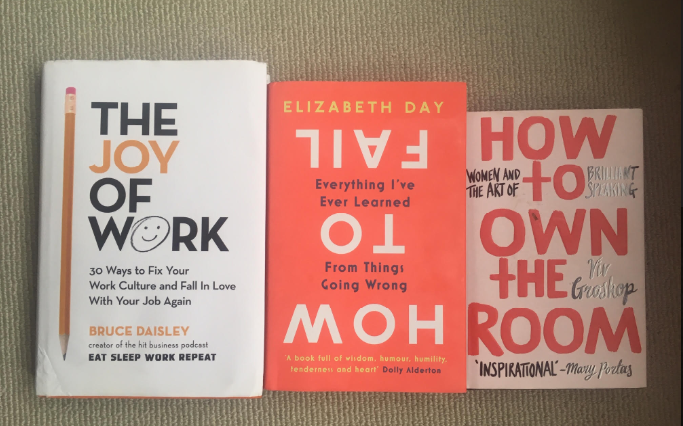 I’ve picked 3 of my favourite recent reads to help you enjoy your job more, get comfortable with failure and smash the next presentation you give. One of my favourite podcasts is Bruce Daisley’s Eat Sleep Work Repeat . So I was excited to read his new book, The Joy of Work. Daisley is European VP of Twitter and both his podcast and book are insightful analyses of what makes organisations high performing and enjoyable places to work. What it’s about: This book is for everyone who wants to rediscover their work mojo and help themselves and their colleagues be happier and have a greater sense of purpose. Daisley talks about how the workplace has evolved over the last few decades, involving longer hours, 24/7 access to emails on our smartphones and growing job insecurity. The wonderful thing about this book is that Daisley offers tips which you can apply straight away, regardless of your seniority. He dissects the modern workplace, drawing on research from psychologists, academics and HR professionals, covering how we can keep our energy levels up in offices with many distractions and pressures, how to help your team connect more effectively and what you can do to make your team more successful. Another podcast that I love is How to Fail, by journalist and author Elizabeth Day, in which she interviews famous people from David Baddiel to Phoebe Waller Bridge to Lily Allen about their experiences of failure. Day’s latest book, also called How to Fail is part memoir, part reprise of nuggets from the podcast. What it’s about: Day covers everything that can be failed at, from work to relationships to sport, and the lessons that we can all learn. This book struck a real chord with me. I spend much of my working day encouraging charity leaders to ‘fail fast, fail forward’ in digital and it’s the thing they struggle with the most. And why wouldn’t they? If you’ve spent decades building an enviable career it can be hard to discuss failure openly. But if we can’t do this then we can’t learn to do things differently- and ultimately we can’t succeed. And one of the hardest things about digital is that leaders need to embrace these behaviours, which require vulnerability, courage and the ability to check your ego in at the door. Day’s book is a liberating read, helping us realise that some of the most impressive people we know are the ones who have failed the most. Failure is the ingredient X of every successful career, and life well lived. Day talks about how some venture capitalists won’t invest unless the entrepreneur who is pitching to them has failed before. Next time you interview someone ask them when they failed, what they learned and how they’ve changed as a result. Whenever you fail, use your feelings as fuel. In Day’s book she describes how failing to get the parts she wanted led to Phoebe Waller- Bridge writing and creating TV series such as Killing Eve and Fleabag. Embrace your failures. There is a recurring theme in the book of how the celebrities who Day has interviewed see failure as an opportunity for transformation. I’ve started allowing 10 minutes at the end of each week to reflect on what has gone well and what could be improved. Small changes can be as powerful as large ones. My final book recommendation is writer and comedian Viv Groskop’s How to Own the Room. If you’ve ever wondered how to give a presentation that makes people sit up and take notice this is an essential read. What it’s about: Groskop talks about how to conquer performance nerves, and looks at what we can learn from famous speeches such as Oprah Winfrey’s ‘Time’s Up’ moment at the Golden Globes. We need to see more women presenting and to help their views be heard. Groskop encourages women to seize every opportunity they have to do this, whether it’s saying a few words at a colleague’s leaving do, making a toast at a wedding or running a workshop at the office awayday. And we need more conference organisers to get more women on platforms, which is why Mandy Johnson’s Great Charity Speakers is such an excellent idea. Speaking is a very physical activity. To do it well Groskop recommends really paying attention to your body when you are presenting, taking time to breathe, smile and feel your feet on the floor. Keep trying new things. If you speak at events with any regularity, you need to keep raising your game. Experiment with new ways of telling stories or getting your point across. I’d love to hear which books have changed how you work.